Don’t just “kickstart your heart” during February, but plan to make healthy eating part of your Food for Life daily plan. Sapna Von Reich, a Fort Collins Food for Life instructor, offers valuable, life-saving nutrition information at her classes. 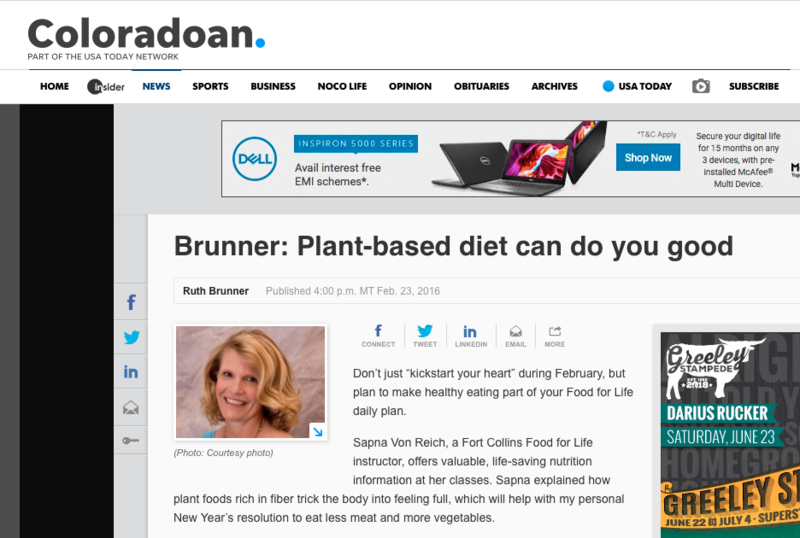 Sapna explained how plant foods rich in fiber trick the body into feeling full, which will help with my personal New Year’s resolution to eat less meat and more vegetables. Plant-based meals are very low in saturated fats. A healthful vegan diet can also increase the after-meal calorie burn by 16 percent. In contrast, foods high in fat clog up your cells and slow down energy conversion. Studies by the Physicians Committee for Responsible Medicine show that replacing animal protein with plants lowers blood cholesterol and blood pressure, and also burns more calories in digestion.